Today more Titanic Facts in Titanic Belfast are housed in a new beautiful building in memory of the ship which is situated on the site where it was originally built in the Belfast Shipyard in northern Ireland. Following on from the sinking of the Titanic Ship it is amazing now to think there are at least 200 Titanic museums that can be found all over the world. 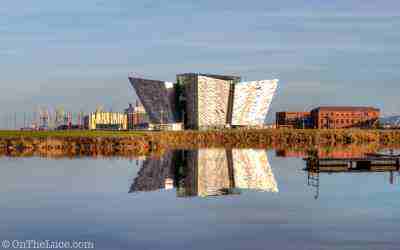 Titanic Belfast is located in an area of Belfast now known as the Titanic Quarter and a scenic image of it is shown below. Titanic Belfast is located in the heart of the former shipyard and is a very distinctive piece of architecture.In November 2011 National Geographic identified Titanic Belfast as the main attraction for visitors to look forward to in 2012 and that has proved to be the case. It charts the rise of Belfast and allows you to see the huge size of the Titanic ship. From the outside the building is stunning. The shape of the building resembles the hulls of four ships. It is a 6-floor building and this state-of-the-art visitor experience tells the history of the Titanic. The visitor begins in turn of the century Belfast and you will learn why this city which was was so industrialised. From there, the story of Titanic conception is told followed by early Titanic construction, fit out, launch and then the tragedy that unfolded on its maiden voyage. The story is brought up to the present with the discovery of the wreck. You can't fail to be touched by some of the personal stories and seeing how the disaster unfolded. The adventure begins the moment you walk through the door. The museum has 9 galleries which all focus on different parts of the Titanic history . One has an filming of the Titanic underwater. Then you are on to a glassed area where you can see the wreck from above. Another is viewed on a ride intended to give you the experience of being on the outside of the hull. If you have children there are enough interactive visits to keep them entertained. The Titanic Belfast does not really house relics from the shipwreck as a lot of artefacts have been sold off . The very human story of Titanic history gives a chance for the visitor to feel a connection with the designers, builders, crew and passengers - a really emotional journey. Indeed you may have already have felt a sense of this if you have seen the hit Titanic movie when it was screened back in 1997, that brought the whole Titanic history back into focus again. The building is designed so that visitors can enjoy breath-taking views also to the slip-ways where the Titanic ship was launched. You will also see the interiors what they looked like from third class up to first class. You will hear so many Titanic facts and information, like the development of Belfast and it's environs through the growth of shipbuilding. It also gives a good account of Harland & Wolff through the years. You can relax and grab a bit to eat if you wish. Already after opening Titanic Belfast since April 2012 is already Northern Ireland's most popular tourist attraction and another addition in the Titanic museum world. It's memory will continue to live on and this is one memory which cannot be found anywhere else in the world.